Our Summer 2018 Issue of Rural Property Pulse is now available. Produced quarterly for nationwide distribution, this publication contains relevant and up-to-date information on rural real estate. 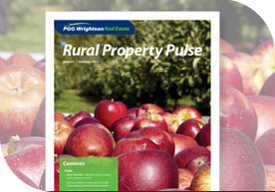 Sourced from our PGG Wrightson Real Estate network of rural sales professionals, it provides a comprehensive review of the current state of the market. ◰ Read our headline article "Subdued spring market set for summer revival"